My first trip to Albarracin was back in September 2009 where we flew in to Valencia and rented a car. The drive took us two hours, although that said, the scenery was like no other I have witnessed before or since. I’m sure it’s not out of this world or particularly unique but it does stand as the only desert I have been through and I finally made an eagerly-anticipated return in June 2014. The difference in those five years was phenomenal: two climbing shops, a dedicated bouldering guide, more lines and much better facilities, although the last could be down to our incompetencies but never mind. It is often touted as the Spanish Fontainebleau and I would kind of concur, although not entirely. The rock type is similar, both sandstone and this comes across in the types of problem you are likely to encounter, especially in the topouts – slopey and knacky, they can often be the crux of any grade problem at either venue. The major difference you’ll find is the abundance of roofs in Albarracin and this is likely it’s most stand out feature. The area Techos is actually the Spanish word for roofing and it’s not alone, although there are more there than in other spots. Still, the opportunity to crank hard on the horizontal and often tick off hard climbs without crimping like a beast is there for all and great photos are easily found here. There are a growing number of areas and lines although I mentioned in a blog post while there that I suspect the best lines have fallen already and I would stand by that statement. Still, at time of writing there were at least eight areas without access restrictions and some half a dozen with, so there is plenty here. A lot of the climbs are stunning too, with striking lines and great holds without the inevitable polish that longevity brings to a crag. 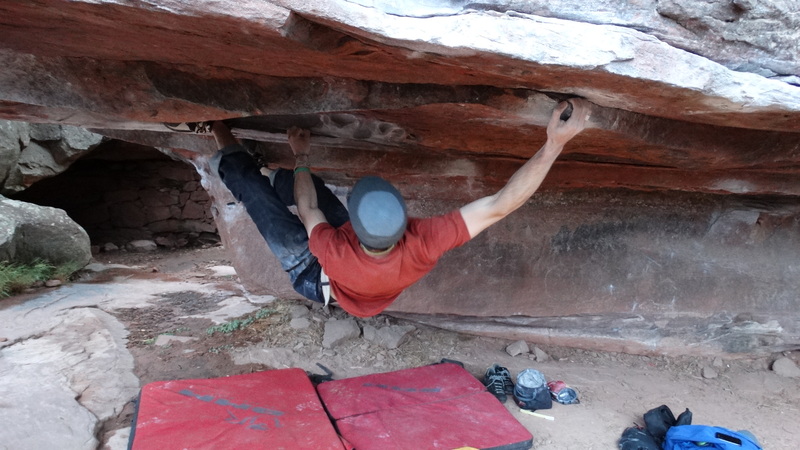 Albarracin was only really found and developed at the turn of the century and until it begins to get the large traffic it undoubtedly deserves, you’re still likely to find good friction on many of the holds, especially in the harder grades. That said, at the other end of the spectrum, when I was first here in 2009, I witnessed a new friend Super Paolo pull a hold off an 8a while stood on his girlfriend’s shoulders and I think has probably subsided now too. Go for an established line and you’re all good. Of course the friction requires good conditions and I was unlucky (or foolish) enough to be there in the midst of a Spanish summer on both trips. While climbing was evidently possible, we were restricted to morning and evening sessions on both occasions and I would probably not suggest it if you had the choice. At an altitude of around 1300m, the depths of winter wouldn’t be that wise either, as i’ve heard of heavy snow in the area and even in September, warm jackets are advised if camping, for the evenings. The obvious suggestion is the usual: Spring or Autumn are the times to go. The sandstone blocks sit atop the Iberian mountains, mid-way between Madrid and Valencia, with the well-signposted town of Teruel being your nearest civilisation. The village is does have cultural heritage too, declared a Monumento Nacional 1961, and is a UNESCO heritage site due to the pre-historic cave art you can go and see (also relevant to boulderers, as this can restrict your climbing slightly). The town proper will have helped with this: i’m not sure why it has large castle walls and a cathedral but that it does, running around the small winding ancient stone buildings that seem to pre-date a spirit level…. It truly is a fantastic village, even if it doesn’t have much in the way of shops. It does have some though, crucially including two supermarkets (one much larger than the other), a good butchers and bakers. Be warned though: rural Spain is not noted for it’s long opening hours, and you’re best to get this stuff either first thing at around 9-10am or evenings 5-8pm and this can encroach on your optimum climbing conditions. I think there is also a small shop on the campsite too. Finally a note on access. When I first visited, Albarracin was still fairly new and not hugely frequented, although it was made abundantly clear in all literature I found to avoid climbing on or around the cave art mentioned above. From what I can gather, this was not heeded by all who went, and I have sadly heard of issues in the past couple of years. PLEASE check access agreements before going; as usual, this could mean the difference between the venue being closed permanently. What is perhaps more saddening is that it wasn’t just problems with where people were climbing: people camping near the cap parks, leaving litter and excrement, things that we all should know better than have put Spain’s Fontainebleau in jeopardy. Again, check before you go. As I mentioned, by the time you get there, this could well not be comprehensive at all but I can only do the best at time of writing and considering I was there this morning, it can’t really be more up to date to the best of my knowledge! Besides, my advice would be to start with the more established areas and progress to others after. As usual, i’ve only commented on the crags that i’ve actually been to. Arrastradero. 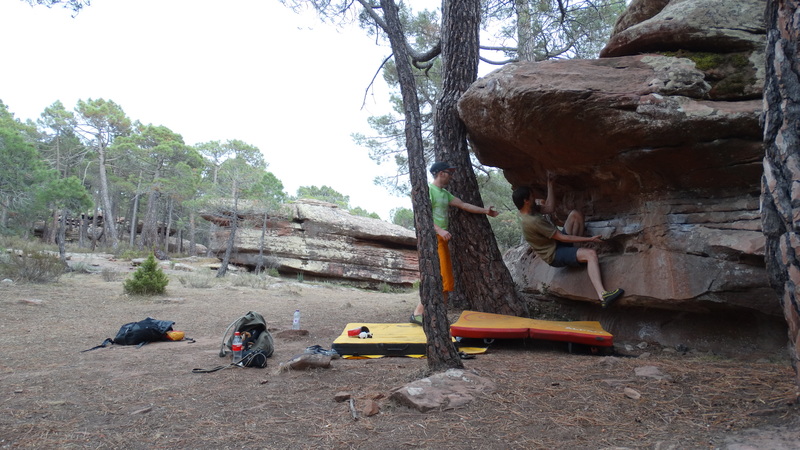 Albarracin’s answer to Stanage or Bas Curvier, Arrastradero is by far the largest area with enough problems to accommodate your entire trip. There is almost too much here to make recommendations on problems to try but a couple of personal favourites would be La Grima 6b (with the neighbouring La Lagrima 6c with a 7a sit start supposedly excellent), Seiscerraro 6b and Grasshopper 7b+ all worthy of closer attention. La Fuente. An area i am very fond of, with a great spread of grades for all. 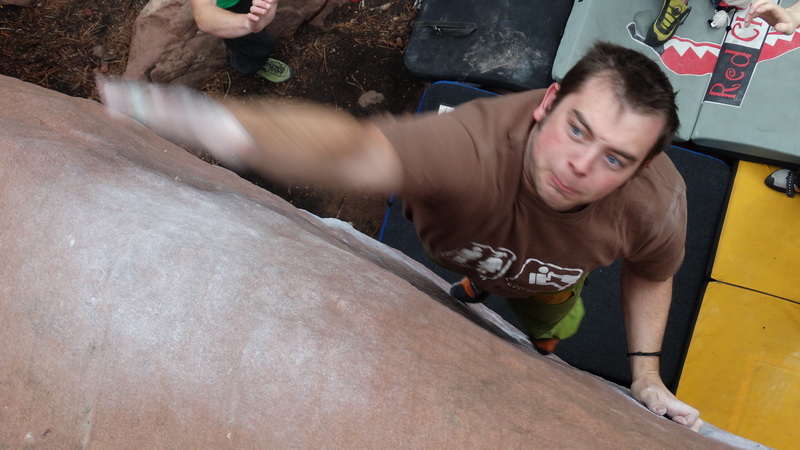 It is home to one of my favourite problems in Albarracin, El Orgasmo 7a+, and not just because of it’s name! Typical of the area, a big roof leads into a cruxy slopey topout. With a fairly short walk in, this area is well worth more than a couple of sessions. Parking. Undoubtedly the most convenient of places and worthy of a couple of sessions at least. While the quality doesn’t exist in abundance, there are some stand out lines to be ticked, including Zooruyo 7a right next to the car. Surely though, this area is best for it’s low-mid grade problems and that essential warm-up session. Peninsula. One of the sectors afflicted by the seasonal access and consequently not an area that i am very familiar with although i did go on that first trip many years ago. Bloc 23 adorned the cover of the E-Bloc guide, sat atop a cliff top with a stunning vista and it also featured in Dosage IV so it certainly has something going for it! Sadly, i can remember no stand out problems, possibly due to a fading memory more than the quality of the climbs. Psicokillar. Another sector closed for much of the year and with a beast of a walk in. Still, for those with enough cardio-fitness to trudge in, you’ll not be disappointed. I was very disappointed to miss out on my second trip, as i was itching to get back on the namesake problem of the area, Psicokiller 7a+. A truly stunning line and one of the best i’ve tried across Europe – you walk in to the beginning of this problem as the ground slowly rises into the cliff, getting steeper and steeper until you find yourself horizontal before escaping right into a neighbouring crack. Don’t miss out if you get the chance. Techos. As alluded to above, this is the Spanish word for “roof” and that alone should give an insight into what to expect here. El Chimpance 6b and Gorillaz 7a would be two to check out, albeit with a slightly high topout, and the adjoining boulder housing Quebrantamentes 6c+ among others would make the wander worthwhile. That is not to say this is a spot to avoid if you’re looking for climbs less strenuous as there is plenty of variety here too. Oof, yeah, there’s not a lot, as I mentioned in the introduction. Thankfully, the campsite near the climbing, and the one you’ll probably be using, sells a selection of bits and pieces, including gas, which is always handy to know. If I remember rightly, though, I think we were heading into Teruel for most things. Guidebooks. There are two available that i am aware of: the general guide for bouldering in the whole of Spain, E-Bloc. It is easily outdone by the dedicated guide which is readily available in the local shops and keeps the same format as the website mentioned below. Climbing Shops. Two at time of writing, one opposite the bridge and another towards the campsite called Sofa Boulder. As is habit with me, i frequented Sofa Boulder quite a bit and made friends with the owner, finding the staff incredibly friendly and helpful while the stock lacking ever so slightly. The staff in the other shop (whose name, to my shame, i forget) were equally friendly with a marginally better range although their opening times seemed a little more sporadic. Another small store exists on the campsite to the best of my knowledge. Accommodation – Campsites. An obvious site exists just outside the village, past the turning up to the boulders. I implore all do not camp in the car park as this has almost jeopordised access to the entire area in recent years. The campsite is good, clean and has excellent facilities, including bungalows for those not wanting to drag tents and stoves through airports. Accommodation – Hotels. Plenty. As mentioned in the paragraph above, the campsite has bungalows that i am assured are top quality but with a little online savvy, you’ll easily find plenty more available places to stay. The five of us on the second trip stayed in an apartment near the site but there are plenty of options to suit most budgets. Cafes and bars. Thanks to my friend Rocio from Sofa Boulder, we managed to dispel the common misconception that there are no decent eateries in Albarracin. It is not without some authority, as she exclaimed when we enquired but she pointed out two good options. The first is a pizzeria called Meson des Gallo on the main road by the large tunnel out of town. We frequented there often, finding the food superb. The other is up in the town, just out of the town centre called La Taba but we sadly never made it due to poor timing and knowledge of Spanish eating habits. Finally a bar on the bridge that we’d read about known (i think) as Molino del Gato, that we eventually went into and found the aspect astounding – a must visit. Other handy places. Similarly with Font, there is a dedicated website for Spanish bouldering with excellent photo topos, pictures and videos known as norop.es Bear in mind that this site uses user-based grades for it’s problems, meaning that while it is very up to date, you can be a little disappointed to find your hard worked project has been downgraded since publication of the guidebook.